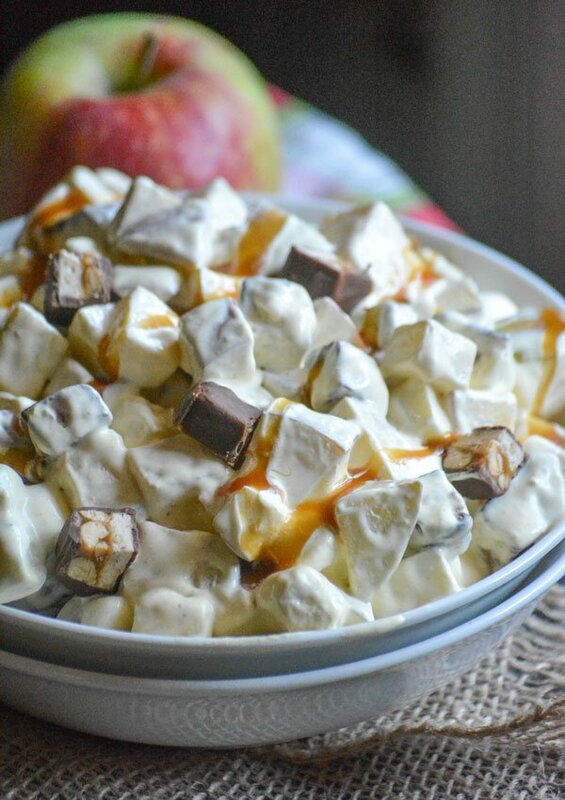 A delicious, seasonal dessert salad- Caramel Apple Snickers Salad features crisp apples, diced candies and marshmallows tossed in a sweet, creamy whipped dressing. 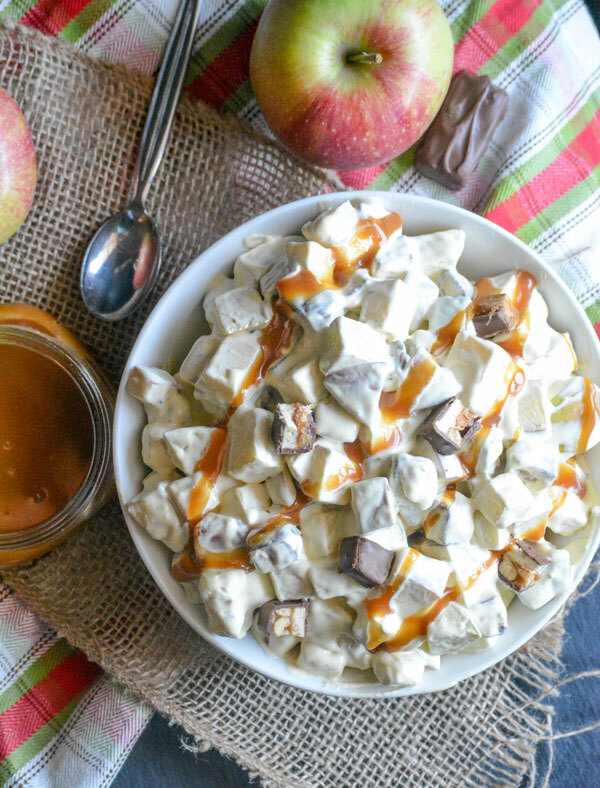 Topped with a drizzle of smooth caramel, it’s an easy treat that doesn’t skimp on Fall flavor and is perfect for a crowd, even potlucks or parties. So a few weekends we made our annual trek to the apple orchard. If you were here for the Apple Week event, you probably saw some of the yummy treats we made with the bushel we brought home. There were some real winners, like Roasted Apple White Cheddar Soup, Apple Pie Pancakes, and even a recipe for Quick & Easy Apple Cider Glazed Donuts. But there was one thing that’s a tradition, that we didn’t mention. 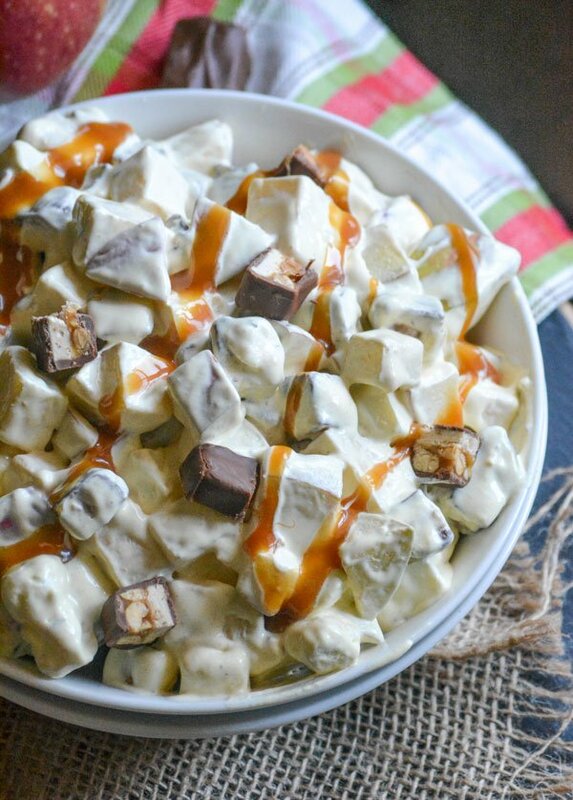 Our Caramel Apple Snickers Salad. The boys all look forward to having this for dessert when we come home from the orchard, and this year was no different. It was Son # 2’s first question when we pulled onto the highway to head home. Did we have all the necessary ingredients? We did not. So I stopped at the grocery store on the way home, he ran in, and bought the extras we needed, with his own money, to make a batch right away. I love how easy this is to prepare and how it takes advantage both of the fantastic prices on fresh picked apples, but also the sales on candy in anticipation of Halloween. Cheap and easy? That’s my kind of dessert! Inundated with apples after an orchard trip? Trying to find recipes to use to take advantage of the awesome fall prices at the grocery store? 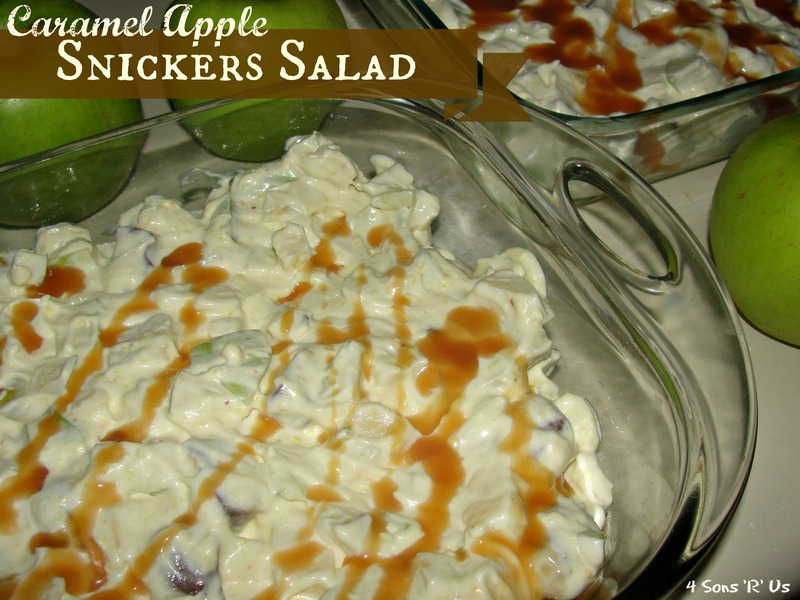 If you’re looking for something different to do with all those apples, be sure to give this Caramel Apple Snickers Salad a try. 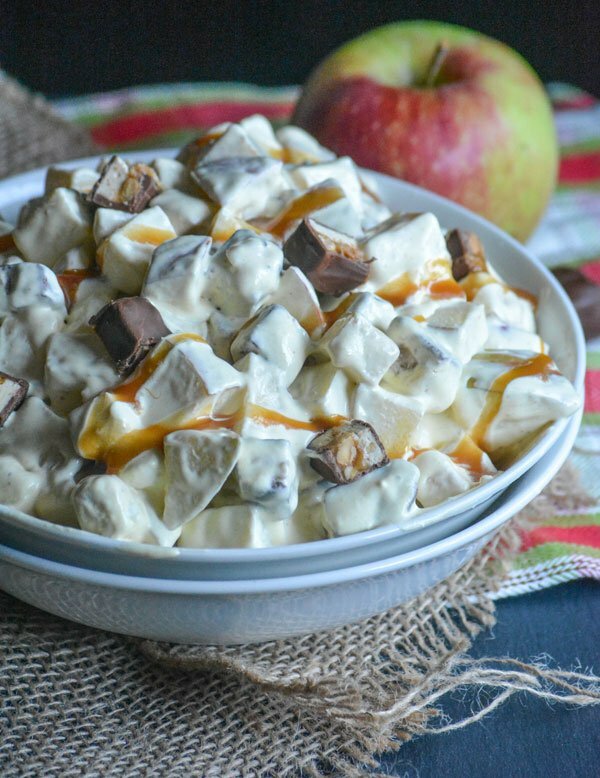 A creamy dessert salad featuring crisp, diced apples, marshmallows, and snickers candy bars covered in a yummy whipped dressing. In a bowl add pudding, milk, and cool whip. Stir until evenly combined. 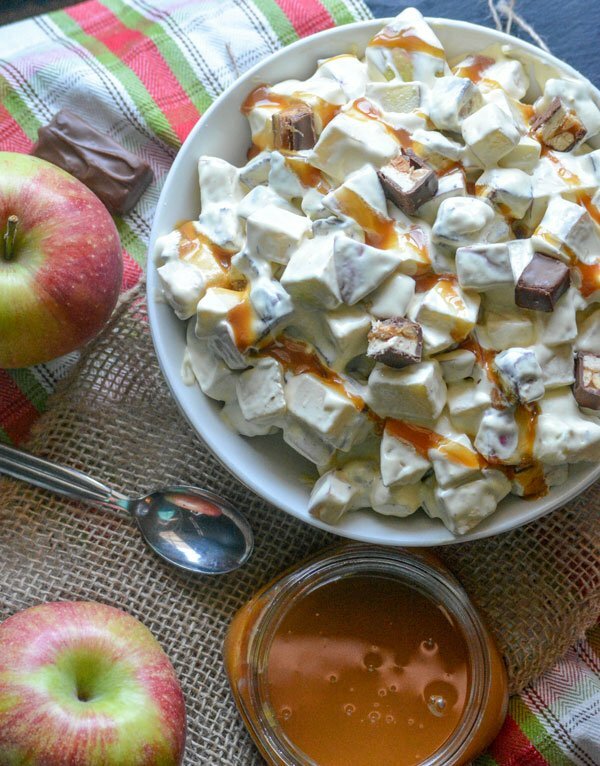 Chop up snickers and apples into bite-sized pieces. Stir the snickers, apples, and marshmallows into the pudding mixture until evenly combined. 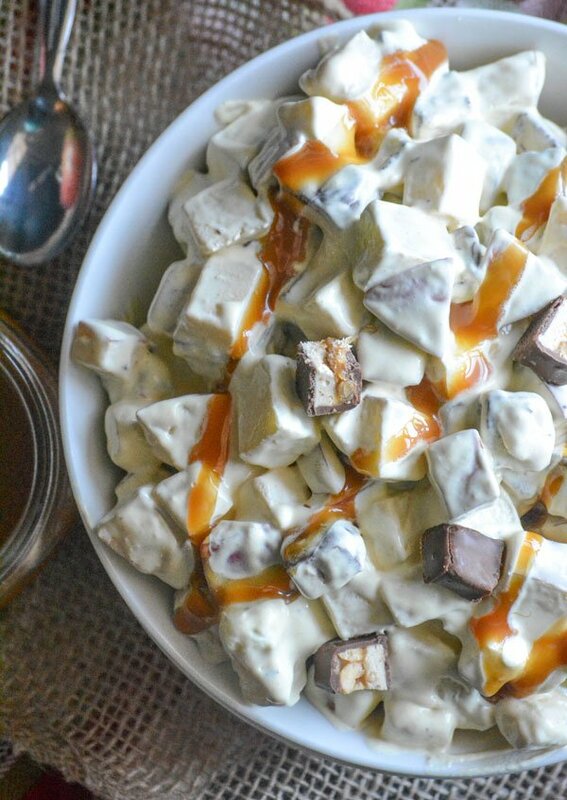 Pour the snickers salad into a serving dish and drizzle with the caramel topping. Top with extra pieces of candy before serving, if desired. I want to go apple picking with you next time. What a fun tradition! Thanks for sharing the yummy treat with us at FF!